Each month, we ask you to share your questions about farming, food or Sacrewell with us on Facebook. The person who writes the best question wins a free family admission pass for a day at the farm, as well as having their question answered on our website. This question came from James Atkin. We have exciting news! This summer Sacrewell will be welcoming two red Dexter cows. Dexter cows are a miniature breed, originally from Ireland where their small size helped them thrive in rocky and mountainous terrain. In the UK the most common dairy breed is the Holstein-Friesian cow. In the 1970s the average Holstein-Friesian cow produced 21 pints of milk a day, whilst in 2012 the average was 42 pints a day. This increase is due to selective breeding. Selective breeding is where a farmer chooses to breed from the animals that have the best traits, for example a dairy farmer would use the cow that produces the most milk to have calves that should also produce lots of milk and a dairy farmer would not breed from cows that don’t produce a lot of milk. It was recently recorded that a Holstein-Friesian cow in Wisconsin, USA, produced 574711 pints of milk across the year, which is the same as 184 pints a day! Weather – sudden and extreme changes in the weather can cause a decrease in a cow’s production of milk. Age – As a cow gets older they are much better at producing milk. They begin to produce more milk after they have stopped growing at the age of 3 to 4 years. Cows and milk production play a big part in the Sacrewell story. In 1926 a small herd of Shorthorn cattle arrived at the farm. By May 1965 the herd had increased to 100 cows and the breed of cattle had changed from dairy Shorthorn to Jersey cows which produce much creamier milk. 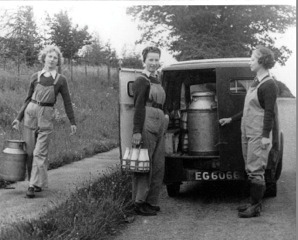 The milk produced was sold and delivered in the surrounding villages. William Scott Abbott kept detailed records of his own selective breeding programme, photographing the cows and the calves that they produced. Dexter cows are the smallest breed of European Cattle and come in three different colours: red, black and dun. They tend to be very gentle, relaxed and caring in nature. These small cows measure 38 to 44 inches at the shoulder and weigh less than 1000lbs (450kg), which is roughly the weight of a grand piano! Whilst Dexter cows are a miniature breed of cow, they still can produce large quantities of milk, with the average Dexter cow producing 16 pints of milk a day. You can make 320 cups of tea each day with the amount of milk produced by the Dexter cow!